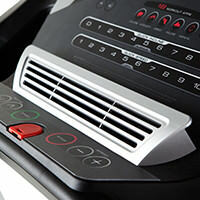 ProForm is a big name when it comes to treadmills and we will be looking at ProForm’s 520 ZN. 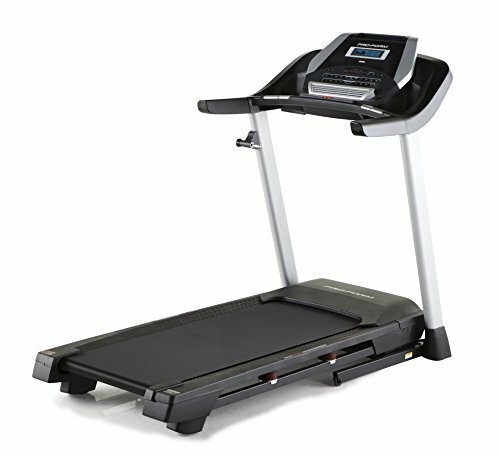 This is a staple part of their range and is at the cheaper end of their treadmills. I would recommend it highly for anybody looking for a great entry-level running treadmill. It’s got lots of useful options and is very well built and smartly designed. For entry-level or those on a budget, it’s perfect. For advanced runners or people wanting a high-end treadmill, I would suggest looking at other options. I’ve been a runner for most of my life, beginning in high school. Back in those days I kind of stumbled into the athletics and cross-country teams thanks to natural endurance ability. Since then I have gone on to compete at an international level in amateur combat sports so running has become a very important part of my fitness routine, and I usually run 2-4 times a week. In the last 10 years a lot of my running has been on a treadmill. Of course I still love to get outdoors, and I’m sure you do too! It can be easier to monitor distance/speed and other factors on a treadmill though. Also the weather, pollution, or crowded places can put us off going outdoor running at times, so a treadmill is a nice option to have. Below we have listed some average review ratings for this unit and we take a deeper look at some pro’s and con’s of this particular treadmill. Read on to learn more! The deck is an important part of any treadmill. ProForm’s 520 ZN has a deck with lots of benefits for you. Firstly the deck folds up neatly. This gives you more versatility because you can have it set up only when you need it and can fold it away for more floor space at other times. It can also be useful for safety. If you have children or pets it’s nice to know they won’t accidentally turn the treadmill on and get hurt. Finally, folding away makes it less likely to get dirty or be damaged when not in use. 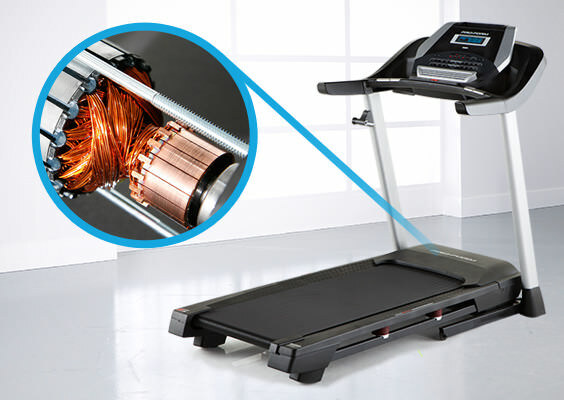 Folding and un-folding is very easy with this treadmill. There is a catch to secure it in the folded position, though you have to lift and lower it yourself because there isn’t any automated mechanism for these tasks. The deck is very strong and can handle around 136 kg of weight. Of course it’s also got ProForm’s trademark cushioning system, featured on all of their range. They call it ProShox and it’s basically a suspension system, so it absorbs some of the impact which usually goes to your joints. 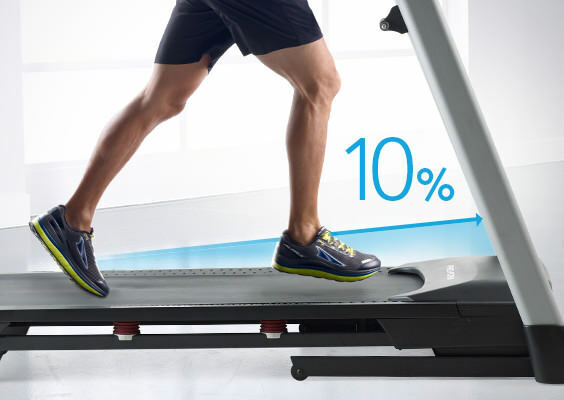 That means your legs will stay healthier and you’re less likely to get injured when running on this treadmill. With that said, the cushioning is a perfect level so it doesn’t cause too much bounce or take any extra energy to run on. The bounce is hardly noticeable when running and its deck holds strong with no slipping or sliding of the belt. The belt measures 20” x 55”, and has a well textured surface which gives good grip and less chance of slipping off. Some people might be worried that a deck with such good cushioning and a fold-away feature would not be as durable as a solid frame. That isn’t true. ProForm treadmills all share the same tough materials. One drawback that comes with this durability is its weight, it comes in at close to 100kg and can be difficult to move because of that. It has a great motor too, complete with a 25 year warranty. That should give you plenty of confidence in how long it lasts, after all they wouldn’t give that long a warranty without believing in it, right? This particular motor is designed to operate for short or long time periods and won’t overheat on longer runs. While some cheaper motors might slow down when heavier users are on the treadmill, that isn’t the case with the 520 ZN. It keeps on going at the right speed even if it’s close to the max. weight load. Incline settings use a separate motor which is also covered by the warranty. This one is a standard unit made to raise/lower the treadmill, which is equally reliable and has much less work to do. A lot of budget treadmills are only focused on the running side of things. They neglect important little features which could be very useful. To get things like built-in sound systems and cooling fans you usually need to spend more and get a more upmarket type of treadmill. ProForm have focused on this area for their 520 ZN. It comes with a built in fan right on the user console. The fan has two different settings and you can use it to help keep you cool on hot days or hard runs. Nobody likes to feel overheated and this fan does a good job of cooling you down. There are also cup holders on each side. Both of these are fine for bottles/flasks to be placed on so you have somewhere to keep water at hand, and could even use the opposite side for a post-workout shake or similar. If not, I usually just throw my sweat towel on there, again it keeps it handy so I can wipe off excess sweat during the run. There’s also a music input port which you can plug almost any device in to by using an aux cable. ProForm’s 520 ZN has a pair of built in speakers so you can play music/videos out loud, and there’s also a slot at the top of the console which is perfect for holding phones/tablets. Sound quality is good with this system, although not amazing. With that said, how much sound quality do we actually need while working out? It’s good enough to hear clearly, just not HD quality. There is also a heart rate monitor built in, a standard feature for most treadmills nowadays. Along with the adjustable speed and incline, there are a lot of different pre-made workout programs you can do. 18 to be exact, all of them designed by a certified trainer, which again is expected with professional fitness products. The variety of programs means you can focus on different goals as well, whether you’re training to improve your cardiovascular health, lose weight, or are preparing for a sporting event. It also gives a lot of options so you don’t have to repeat the same workouts and get bored of them. The display uses nice, large figures on the display making it easier to see and read them. However, the screen is quite small so there isn’t much space for information and it only gives a little bit of basic info at a time. You have to use the console to switch settings when you want to see other information. Also the display on our treadmill was not backlit. I’ve spoken to lots of runners and those who have tried this product said they also had the same problem. So despite being advertised as backlit, the display is not backlit and can be hard to see unless you’re in bright surroundings. Running is usually a progressive exercise, meaning over time it needs to be made harder to keep on improving. We do this on a treadmill by raising the incline or increasing the speed. The ProForm 520 can do this but it has a low limit on both sides. The speed is capped to 10mph, which means you can do a quick jog at best and won’t be able to sprint on here. The incline is also capped at 10%, which is enough for most people but not enough for activities like hill sprints, or mountain training. Without bigger limits, there is only a certain amount of fitness which can be gained from using this treadmill. When it comes to treadmill features, they almost all have some pre-made programs and other basics like a heart monitor, cup holder etc. To stand out a treadmill has to go beyond the basics. That could mean designing and saving your own programs, saving stats on your performances, or providing a variety of information on your workout. This unit doesn’t do any of that, other than the basic calories burned/distance ran/average speed type of info. It won’t save any settings, it doesn’t remember any past performances, and it also doesn’t allow you to create your own workouts, even just for one-off usage. That makes it kind of rigid in a way, and limits what it can be used for. Overall the Proform 520 ZN is a great budget treadmill. It has many useful features and a great frame/deck with lots of durability. It also has some nice features like the speakers/sound system, fan and the folding deck. These make it more appealing for less intense runners, and because it’s offered at a cheap price it’s a great starting point to get into running. However the con’s mentioned above are enough to not recommend it for advanced runners or athletes. They would be better off investing in a high end model instead of this one.